But, many people walk into the dealmaking process without considering business buyers at all. We know a lot of people who stop themselves from ever pursuing the sale of their business simply because they don’t know what kind of buyers are out there, let alone how to get connected. They are scared about confidentiality and, honestly, most of the time too comfortable to take any risk. We hear you. This isn’t easy information to find. If we didn’t work with business buyers every day, we’d be lost too. The first thought on almost everyone’s mind is valuation. Business owners are looking to get “maximum value” for their company when they sell, and advisors are promising they can help those business owners get there. But, beauty is in the eye of the beholder. How valuation (which is really just a number) becomes the actual purchase price and terms depends completely on the buyer. We’ve all met the guy at the bar who sold his company for 22x EBITDA. Sounds great on paper. But, did he actually collect any of it, or was it all earn-out? Acting like buyers only want to talk about what they pay, not when and why, is foolish. We like to tell people we can get them $100 million for their company – if they’ll take $1 per day for 100 million days. No takers yet. The problem with not considering business buyers lies in the opportunity cost. What will you miss if you don’t see the whole picture? So, let’s up those chances of a successful deal! 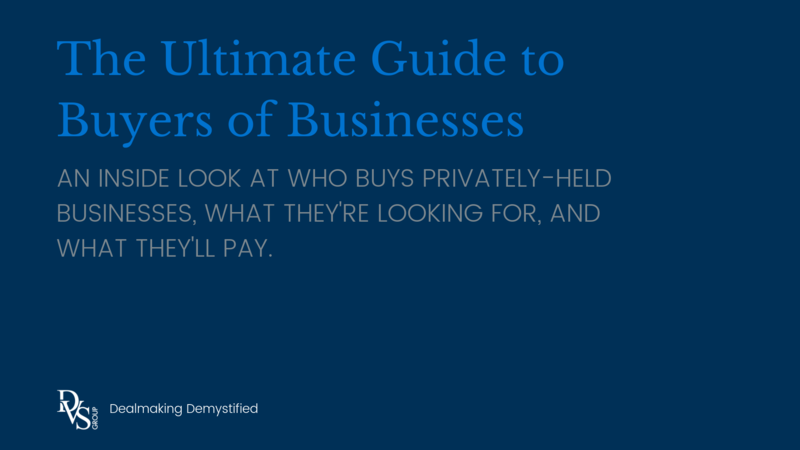 Here’s The Ultimate Guide to Buyers of Privately-Held Businesses. It’s chock-full of information on business buyers, so you’ll know what to expect when expecting to sell. There are two main buyer types: strategic and financial. Note – There is one more buyer type not mentioned above: The management team. Many business owners want to sell to the key employees already running the company. The management team is a viable buyer. But, because they are already in the context of a business and do not have to do an acquisition search, much of the information discussed in this post does not apply to them. There are many characteristics that differentiate the buyer types. Here are 5 different deal considerations that tend to separate one kind of buyer from another. Many of the following charts characterize businesses using EBITDA. Read The Ultimate Guide to EBITDA to learn about this financial metric. The more expensive a business gets ($10M+ EBITDA), the less likely it will be an option for owner-operators or search funds. Conversely, if a business is too small (<$3M EBITDA), it will likely not be attractive to family offices or private equity. Strategic buyers make acquisitions across the range of business sizes. 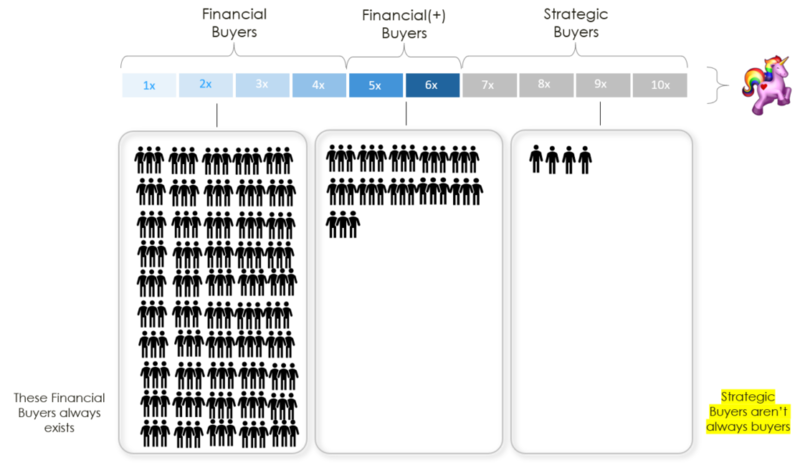 Typical capital structure changes as the business size increases – debt sources change and roll-over equity is included. Often, the deal multiple increases as business size increases. These investment criteria hold varying weight with buyers making an acquisition decision. Strategic acquirers are more concerned with synergistic opportunities; while, other buyers consider operational metrics much more closely. The following table ranks the importance (Low, Medium, High) of certain criteria to the 5 major buyer types. Note that many of them are not financial! Case Study: Three Buyers, Three Different Investment Criteria – One of our strategic buyer clients, Lighthouse for the Blind St. Louis (LHB), had very specific investment criteria in their acquisition search. As a nonprofit, their mission is to assist individuals who are legally blind maintain dignity and independence by making available employment, education and support services. So, when looking at potential acquisition targets, LHB had to be certain that the operations of the business could be performed by its blind employees. Financial buyers like Randy Edge or BOK Financial have much looser criteria. As an individual buyer, Randy was looking for a business he liked both financially as an investment opportunity and day-to-day as a job. In contrast, BOK Financial was only looking for an investment opportunity. Nobody on BOK’s team was planning on running the acquired company day-to-day. A strong management team is a vital component of acquisition targets for private equity buyers such as BOK. All three of these buyers completed successful acquisitions using their unique investment criteria as a guide. Tear Mender and RapidFix met LHB’s needs by providing operations appropriate for their blind labor force and products that expanded into desired markets. LHB relocated the businesses to St. Louis, which added jobs for underserved community members. InStore Design Display and Clear Impact Acrylics met Randy’s needs with solid financials, growth opportunities, and a gap in leadership. Randy could add value as both an investor and operator. Heartland Food Products met BOK Financial’s needs with the company’s proprietary product and strong market position. Heartland also had a completely intact management team through the closing of the deal which allowed the company to operate without daily intervention by BOK. The chart below illustrates that strategic buyers are almost always able to pay more for a business. However, just because they can doesn’t mean they will. We have found many strategic acquirers like to pursue a very patient strategy looking for companies in distress, while financial buyers almost always prefer companies with strong growth trends and healthy balance sheets. There are very few buyers on the high end of a business’ valuation range. Depending on the seller’s minimum acceptable valuation there may be few, if any, buyers who would look at the company seriously. Be sure you understand the total buyer pool and are willing to be patient if you want top dollar. We always say you can get your price OR your terms. If you’re flexible on terms you can drive a higher price; if you want all your money in cash at closing, prepare to have a much smaller buyer pool and possibly a lower than expected offer. $1-3M EBITDA Businesses – As a starting point, businesses with $1-$3M of EBITDA have very few buyers who can afford the company. It’s too small for most professional investors but too big for most individuals. These companies may also have a management team that is somewhat autonomous but still relies heavily on the founder/owner every day. Because of these roadblocks, it pays to be very prepared and systematic in your approach to marketing these kinds of companies for sale. You may need to accept some unusual financing terms to get this deal over the finish line. Often, the dealmaking key of understanding business buyers is missed because there’s a lack of information and an unnecessary emphasis on valuation. It’s important to understand buyers of businesses because you can’t sell your business if nobody will buy it. As we continue to work with business buyers day-in and day-out, we learn new things about them and what’s important to them in their acquisition searches. We’d be glad to share that insight with you. Please give us a call or send us an email with your comments or questions.